One of the two pulpits in the Ravello Duomo.In addition to glorious views of the surrounding wooded valleys and down to the crinkly line of the Amalfi Coast below, Ravello has three key sights: the Duomo (cathedral) and two sumptuous gardens—Villa Rufolo and Villa Cimbrone—open to the public. Ravello's Romanesque cathedral was built in 1076, the central bronze doors cast in 1099 at Constantinople and featuring disarmingly simple low relief panels of archers, warriors, and Bible scenes. 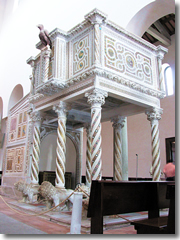 Inside are a pair of gorgeous 12th-century ambones, or pulpits, carved of marble and carried on the backs of lions. 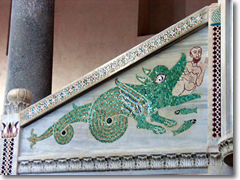 A detail from the other pulpit in the Ravello Duomo.The ambones' panels are inlaid with mosaics of swirling designs, Christian symbols (look for the whale swallowing Jonah, pictured to the right), and fantastic mythical beasts. In the small, attached museum (adm) are some Renaissance busts, late Imperial cinerary urns, and more medieval carvings and bits of mosaic. Piazza Duomo. Open daily; closed for riposo. 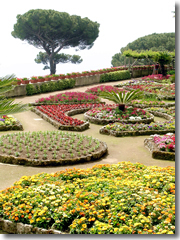 Gardens of the Villa Rufolo in Ravello. (Photo by JosefLehmkuhl) The Rufolo were Ravello's most powerful family in the Middle Ages, and it's a sign of how long the Arab influence lingered in Southern Italy that most of the villa—anchored by a no-nonsense 100-foot stone tower and started in the 11th–13th centuries —is tinged with Islamic architectural influence, especially in the distinctly Moorish courtyard. The Rufolo family added to for generations in Saracen and Norman styles. The rooms of the restructured central villa are now used for art exhibits. The surrounding grounds—filled with intimate flowering gardens set into the extensive villa ruins above a spectacular view down the eastern Amalfi Coast—are the backdrop for excellent outdoor concerts. Piazza Duomo. tel. +39-089-857-657. www.villarufolo.it. Open daily. The most beautiful place I have ever seen in the world is the landscape of the Belvedere of Villa Cimbrone in a bright winter day, when sky and sea are so vividly blue that it is impossible to distinguish the one from the other. Villa Cimbrone Gardens, Ravello. The 1904 villa itself, built for English Lord Ernest William Beckett and riddled with pretty little cloisters and crypts to explore, isn't nearly on a par with the Rufolo, but the surrounding gardens are magnificent. Draped down the steep hillsides from the highest point in Ravello, the gardens of the Villa Cimbrone are a huge playground of palms, magnificently spreading umbrella pines, ivy-clad walls, hidden flower gardens guarded by statues, panoramic terraces lined with busts, and vertigo-inducing clifftop vistas from tiny temple-like gazebos. They were designed to drink in the views at every turn, most spectacularly from the bust-lined "Infinity Terrace," with a postcard view up the coast, and from the Belvedere Cimbrone, with a 360-degree panorama around the Gulf of Salerno and up the Amalfi Coast. At the end of Via S. Chiara (take Via S. Francesco out of Piazza Duomo). Open daily. In July especially, they celebrate the music of Richard Wagner (another Ravellophile) with performances by the likes of Placido Domingo conducted by Zubin Mehta and backed by world-class orchestras from Israel, London, Moscow, etc. Ask at the tourist office for details. How long does Ravello take? 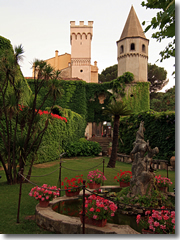 Planning your day:Ravello can easily be just a day trip of a few hours from Amalfi. If, however, you crave a more relaxed, quiet, cool place to spend the night along the coast, Ravello is just about perfect. Plus, its summertime series of open-air concerts—in lavish gardens and ancient church cloisters—make it an ideal place to spend an evening..